Since its publication in 1975, The Miracle of Mindfulness has been cherished by generations of readers for its eloquent and useful introduction to the practice of meditation. 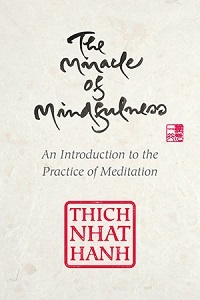 Readers interested in an introduction to Buddhist thought, as well as those seeking to learn about mindfulness and stress reduction, continue to look to Thich Nhat Hanh’s classic work for guidance and inspiration. This new hardcover gift edition features elegant calligraphic illustrations by Thich Nhat Hanh, as well as a dozen photographs spanning his early days as a peace activist to his life in Plum Village, a spiritual community that he founded in France. Also included in this edition is a historical chronology of Thich Nhat Hanh’s life and work, and a revised afterword by Jim Forest. “Thich Nhat Hanh’s ideas for peace, if applied, would build a monument to ecumenism, to world brotherhood, to humanity.” —Martin Luther King Jr.